Two fresh baked pretzels with horseradish mustard sauce and bacon aioli. Cauliflower Crust, baked & topped with Pesto, Feta Cheese & Tomatoes. Roasted garlic hummus, feta cheese, stuffed grape leaves, black olive tapenade, and mediterranean salsa. Served with garlic pita. Ten buffalo-style wings tossed in your choice of hot, mild, or bbq sauce. Served with your choice of ranch or bleu cheese, and celery sticks. Corn tortilla chips topped with pepper jack and cheddar, salsa, sour cream, black olives, and jalapeños. Pepper jack and cheddar cheese, red peppers, portobello, tomatoes, and scallions, all in a stone baked flour tortilla. Served with black olives, salsa, jalapeños, and sour cream. Six breaded and fried tenderloins. Served with honey mustard and bbq sauce. A basket full of cheddar nuggets, breaded, then fried and ready to melt in your mouth! Served with marinara and chipotle dipping sauces. A basket-full to share with your friends, and family. Beef, turkey, and pork, stewed with onions and bell peppers, in a tangy chili stew. Topped with pepper jack and cheddar cheese, sour cream and scallions. Served with beer bread. Served with lettuce, tomato, red onion, dill pickle, and brew city fries. Gluten free buns and wraps are available. Seasoned buffalo chicken, marinated in our mild buffalo sauce, with romaine lettuce, chopped tomatoes and bleu cheese dressing. Served in a garlic and herb wrap. Roasted turkey breast with bacon, lettuce, tomatoes, and cranberry mayonnaise. Served in a garlic and herb wrap. Served on a Sub Roll with Swiss Cheese & Sauerkraut with a side of German Potato Salad (instead of fries) & Spicy Mustard. Chef Darrell's famous bbq braised beef brisket. Topped with smoked gouda cheese. Served on a fresh potato roll, with a side of kohlrabi and brussel sprout slaw. Authentic German liverwurst, topped with a spicy German mustard and sliced red onion. Served on marbled rye bread. Seasoned grilled chicken breast topped with bacon, cheddar cheese, and jalapeño mayonnaise. Served on a fresh potato roll. Grilled salmon fillet topped with hoisin sauce, wasabi mayonnaise and pickled ginger. Served on a fresh potato roll. A veggie beet burger grilled to perfection, and topped with your choice of cheese. Served on a gluten free roll. Housemade beef meatloaf with your choice of cheese. Served on Texas toast with a side of tobacco ketchup. Can be served hot or cold. Three Italian meatballs with marinara sauce, baked in a sub roll and topped with mozzarella, fontina, and parmesan cheese. Mesclun greens, carrots, cucumbers, grape tomatoes, red onion and shredded asiago cheese. Served with your choice of dressing. Fresh romaine lettuce tossed in our tuscan caesar dressing and topped with croutons and parmesan cheese. Baby spinach topped with goat cheese, beets, cranberries, walnuts and red onion. Served with a warm bacon vinaigrette. Mesclun greens, topped with our homemade black bean salad, cucumbers, grape tomatoes, red onion, and crumbled bleu cheese. Served with your choice of dressing. Romaine lettuce, ground turkey with bell peppers & red onions, crisp tortilla strips, grape tomatoes, pepper jack and cheddar cheese. Served with your choice of dressing. Our homemade dough, topped with marinara sauce, mozzarella and fontina cheese, roma tomatoes & fresh Basil. Our homemade dough, topped with pears, walnuts, caramelized red onions, bacon, gorgonzola, mozzarella and fontina cheese. Baked and topped with mesclun greens which are tossed in our bleu cheese dressing. Beer battered haddock with sautéed vegetables and brew city french fries. Pan roasted chicken with our homemade marsala wine sauce. Served with your choice of starch and sautéed mixed vegetables. Grilled boneless pork chops with your choice of starch, apple sauce and sautéed vegetables. Our Bistro Steak is juicy and grilled to order, topped with a madeira demi-glace. Served with your choice of starch and sautéed vegetables. Darrell’s famous beef brisket topped with a rich gravy. Served with your choice of starch and sautéed vegetables. Shrimp, chicken, tasso ham, andouille sausage & okra simmered together in a rich, zesty broth (mild to medium spice level). Served with a side of rice and beer bread. Penne pasta tossed in our creamy cumin, sundried tomato and spinach sauce with your choice of sautéed chicken or sautéed shrimp. Homemade beef meatloaf topped with caramelized onion gravy. Served with mashed potatoes & sautéed vegetables. 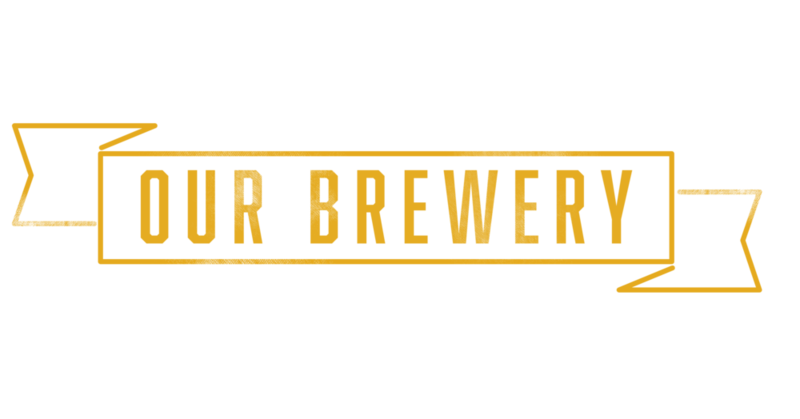 Being one of New Paltz's oldest microbreweries, we take a lot of pride in the brews we make. We take our time coming up with new ideas to be sure to deliver something different and high quality. Our award-winning brewery always has something new. Our brewmaster is always experimenting with new and exciting flavors with Hudson Valley inspired themes! Stop in today for a fresh pint of whatever is on tap! Visiting the Gilded Otter is like getting re-introduced to an old friend every time you go. We offer easy access parking, a unique one-of-a-kind building, remarkable views, and some of the finest food and drink in the Hudson Valley. The atmosphere, friendly staff, and great meals at the Gilded Otter are sure to make every visit both special and unforgettable. 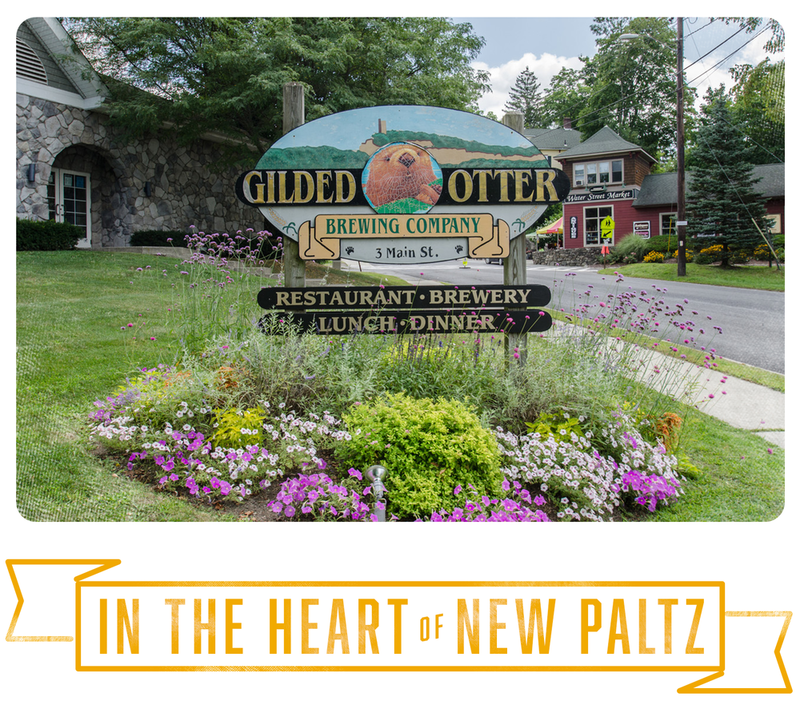 The Gilded Otter is easily accessible from I-87, coming from either the north or south. Take Exit 18 off of I-87 and make a left at the first light onto Route 299. Route 299 will turn into Main Street at the next light. Drive approximately 2 miles through the village, through two more lights after that. One block past the fourth set of traffic lights, The Gilded Otter will be located on your right, just before the Carmine Liberta bridge over the Wallkill River. Turn right onto Huguenot Street and another right into our parking lot. You have arrived at the best brewpub in the Hudson Valley! Click on the map marker to view our 360° indoor tour of The Gilded Otter! Our upstairs dining room is the perfect place to hold your own private party. We require 40+ people to have the room private, but it can accommodate 50-65 people. We will create a menu depending on the package you choose, from our catering options, or our regular menu. Choose from our extensive options to craft your perfect menu. Whether it is a rehearsal dinner, cocktail buffet, or a corporate event, we are sure to have the space to fit your needs. You invite the guests, and we will handle the rest! Print our private party/catering contract today, to get more details for your next party! Visit Our Facebook and Instagram to get updates on events at the Otter!